EPICA is a new EU-African strategic partnership that is bringing together businesses, public sector organisations, and universities to design an innovative and scalable ePortfolio, developed by MyDocumenta, which will improve the quality, visibility, and availability of new skills. The initiative is made possible by co-funding from the European Commission’s Horizon 2020 and is scheduled to run for a period of 36 months, from 1st January 2018 to 31st December 2020. The implementation of EPICA is currently at month eight (M8) of the project life cycle, with a myriad of milestones achieved so far. EPICA is currently being implemented at the eCampus of Maseno University. The eCampus has an eLearning platform modelled around Moodle, an open source learning management system (LMS). The eLearning platform is used for delivering online courses to both on-campus and off-campus Maseno University students. The platform is also being used to deliver common undergraduate courses with very high enrolments such as PHT 112 (HIV/AIDs Determinants, Prevention and Management) and AEN 105 (Communication Skills 1), as well as other Communication Skills courses to regular students. Mr. Michael Opiyoh, Project Coordinator, Head of Technical Team, and Lead Developer. Mr. Opiyoh has a wealth of experience in eLearning and has implemented eLearning solutions in a number of Kenyan universities and tertiary institutions. Ms. Beatrice Okoth, Head of the Project Secretariat. A communications expert, she is the Coordinator in charge of Learner Support Services at the eCampus and also a Lecturer in the Linguistics Department. An ePortfolio meets the immediate needs of businesses and professions. Students who have an ePortfolio ecosystem are either working and advancing within their company, or, if unemployed, are more likely to be employed once qualified. It enables learners with work or family commitments to study at their own pace. For some students, an ePortfolio speeds up the time to completion of a qualification by enabling prior learning to be recognized. Students get individual support and help from their mentors, as opposed to what occurs on other online education platforms. The main weakness is that it works well in some learning environments and less well in others. does not fit the preferred learning styles of many students. Prior to the Maseno University Chapter Open Day that was held on 27th April 2018 at the Kisumu Hotel, the local stakeholders were given questionnaires, which they completed and returned. The main aim of the baseline survey was to find out the level of awareness regarding competency-based learning in the region. The completed questionnaires were analysed and the results shared during the Open Day with the stakeholders. The local stakeholders who participated in the survey included universities/colleges, employers, regulatory bodies such as the Kenya Institute of Curriculum Development (KICD), and students. One of the greatest achievements was that all local stakeholders were trained and sensitised on competency-based learning. 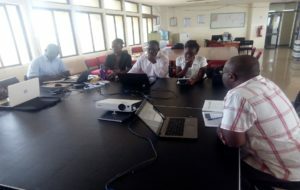 The pre-training online workshop organised by the University of Catalonia in conjunction with MyDocumenta ran for six weeks; four academic staff members from Maseno University were trained online in competency-based design methodologies. This involved skills they did not possess, but which were needed to develop content for competency-based learning. The training materials were delivered effectively to the academic staff, who were trained as Trainers of Trainers (TOTs) and could now design their online courses using competency-based methodologies. The EPICA ePortfolio Maturity Session that was held on Saturday, 1st September 2018 at 10.00am gave representatives from the Maseno University team, comprised of management, academic, and technical staff, as well as student representatives, an opportunity to closely examine their institution’s readiness for the implementation of the ecosystem. For the Maseno team that participated in the process of interpreting the maturity matrix tool, it was a learning process. The second EPICA Consortium meeting, held in Arusha, Tanzania, brought partners from Europe and Africa together at a roundtable. The three-day gathering was very successful and served as the venue for the announcement that the project had achieved all its milestones at month six of the lifecycle. The challenge experienced so far relates to implementing the ePortfolio ecosystem in an environment perceived to be a knowledge-based environment like Maseno University. The majority of professors perceive competency-based learning (CBL) as being suitable for tertiary institutions oriented toward technical crafts that test their students based on skills acquired in fields such as plumbing, masonry, electrical installations, art, and design. At Maseno University, the graduates are expected to come out as persons knowledgeable and well grounded in a given field. Through the implementation of the EPICA project, Maseno University is keen on future incorporation of the EPICA ePortfolio ecosystem in the existing MU eLearning platform, which is modelled around Moodle. This, we hope, will enable seamless technical integration of the ePortfolio ecosystem into the MSU eLearning portal. We also envisage that the cost of acquiring the ePortfolio ecosystem will not be prohibitive to the African partners involved in the project. Working with ePortfolio ecosystems in the region, we will be able to market it to other Kenyan learning institutions, which will ensure the project’s sustainability once the funding period comes to an end.